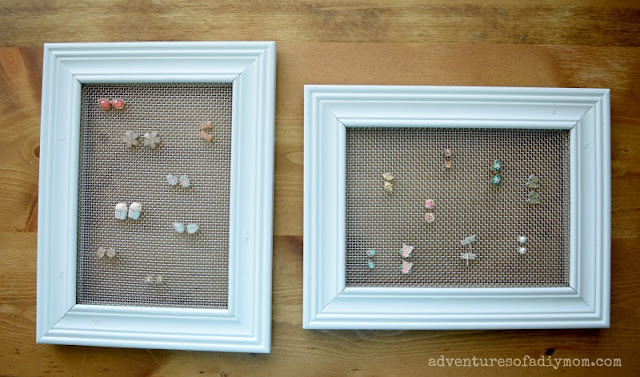 For a while now, earring storage has been a bit of a problem at our house. 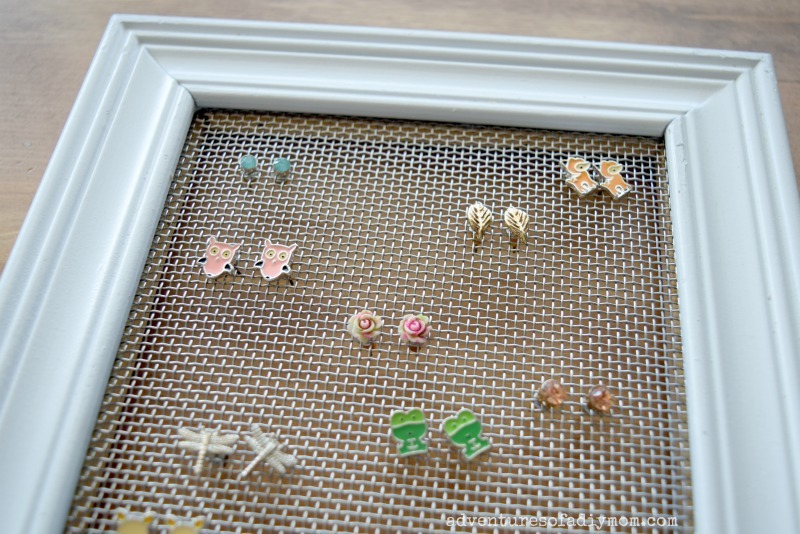 There's a shelf in the closet of the bathroom that has been taken over by random earrings. Matches aren't always possible to find. My girls have some darling earrings, but they never wear them because, well, it's too much work to find them. I recently made myself an jewelry organizer. I had some left over screen, so I made them each a quick little earring display. Now they can see all their earrings at a glance to decide which ones they want to wear. This project is pretty easy. I had a few mishaps along the way, but you can learn from my mistakes. Ready? Let's get started! You can use any size of frame you want as long as you have screen big enough to fill it. I opted for a smaller size, because I already had these frames. Let's talk about the screen. 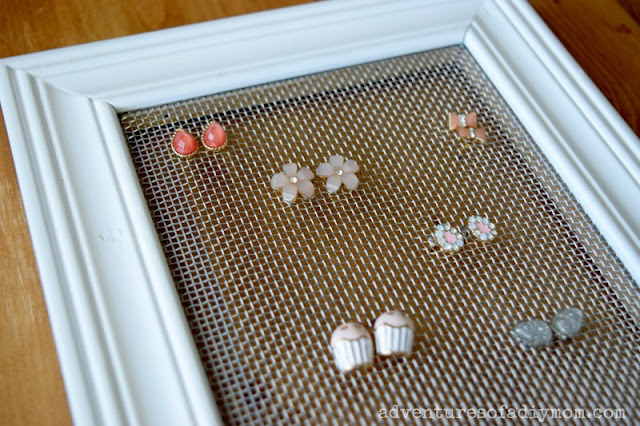 This screen is left over from the other jewelry display I made for myself. I had the hardest time finding metal screen. I checked all the hardware stores near me and all I could find was vinyl screening. There was not metal screen to be found. I ended up going to Amazon and I was able to find this metal screen. I was worried because it's hard to tell from a picture the size of the holes. It ended up working perfectly, so I've linked it for your convenience. 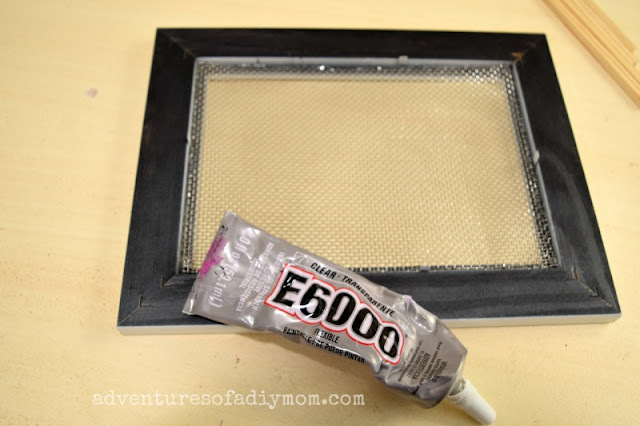 I chose to paint my frames white - but as you'll see in the pictures I didn't paint the back. 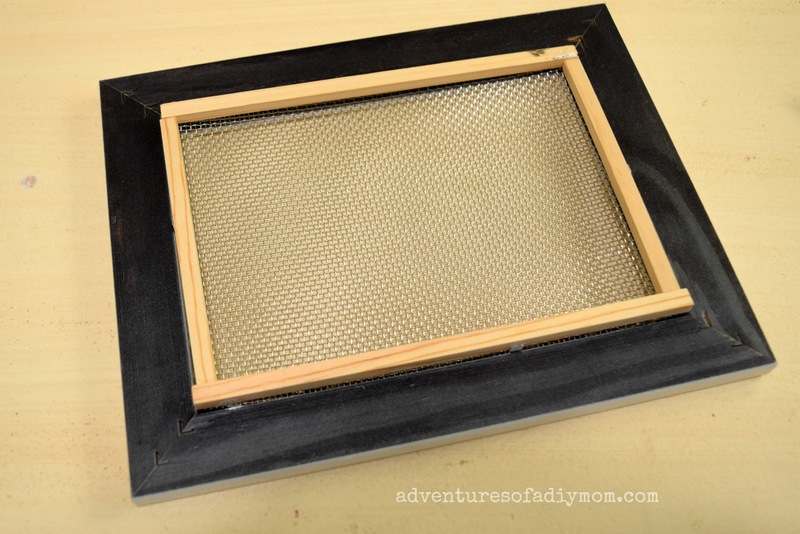 Begin by trimming the screen to fit the opening of the frame. 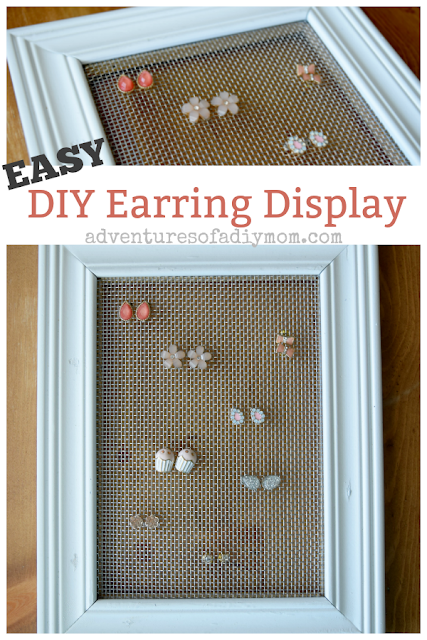 You can use the insert from the frame as a guide. If you don't have the insert, measure from the back side. At this time you can also cut your dowels. I cut two to fit the length, and then set them in place to find the measurement for the width. Once your screen and dowels are cut, glue them in place. 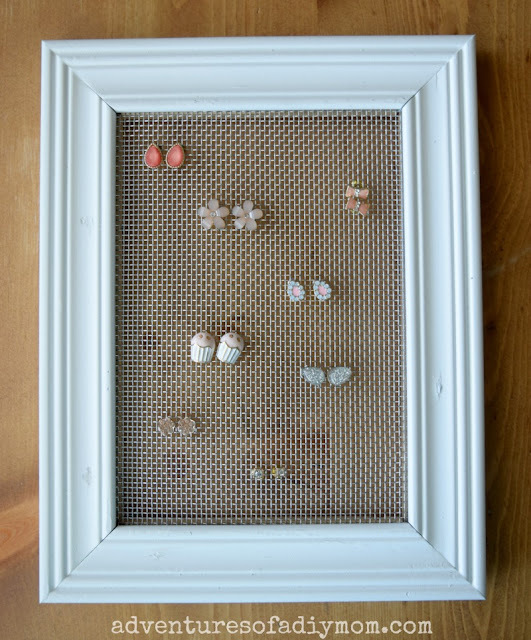 I began by adding a bead of glue along the channel of the frame. Then added the screen. I then added another bead of glue on top of the frame and placed the square dowels in place. I used E6000. It takes a while to cure, but will hopefully be stronger in the end. The problem with I had was that the wood wasn't heavy enough to hold itself in place while it dried. I first stacked some books on top, but being impatient, I decided to secure the wood in place with some brad nails. I don't recommend that, because even though I used very short nails, they popped through the front. I ended up having to pound them down, fill the holes and repaint the top of the frame. 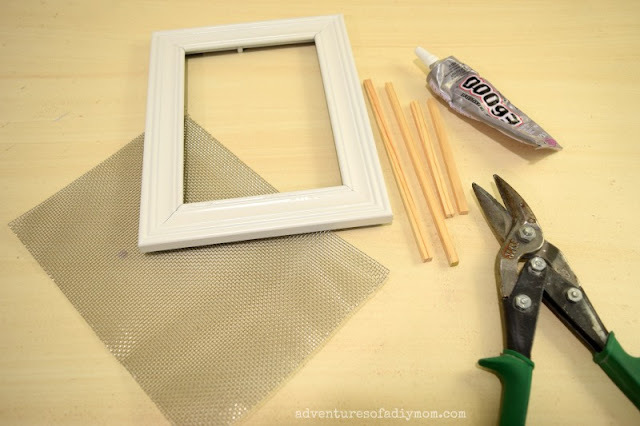 Hot glue is another option and sets much quicker. I don't know how long the pieces would stay secure with hot glue. 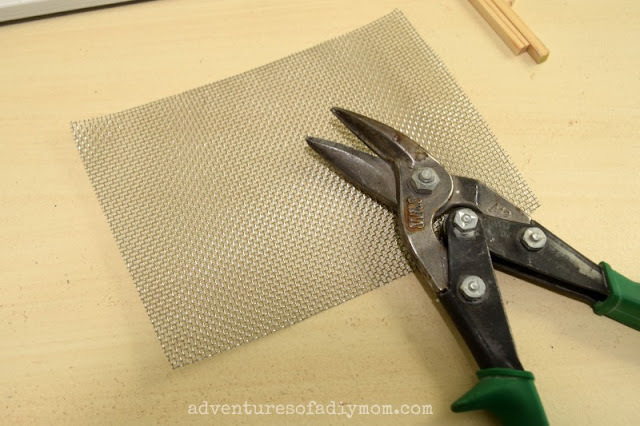 TIP: If I made these again, I would probably do a combination of the two types of glue. E6000 for strength, but a dab of hot glue on the end of each dowel to secure them in place while the other glue dries. What a fantastic idea! It's a great way to get organised, beautifully! Thank you for sharing, and for being a part of the Hearth and Soul Link Party. Hope you are having a great weekend!